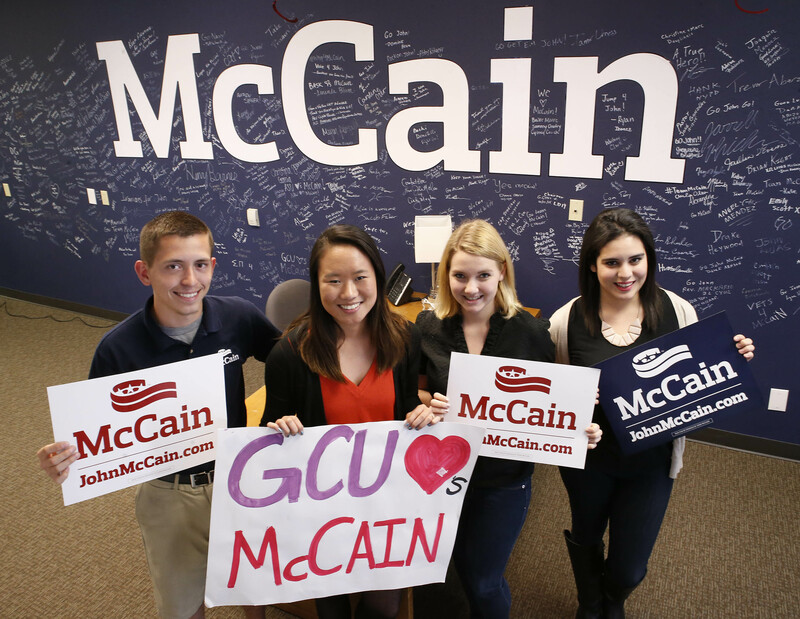 Four of the GCU students who are interns for Arizona Sen. John McCain (left to right) are sophomores Anthony Aguilera, Cathleen Daly and McKenzie Shaver and junior Hilary Gavino. Arizona Sen. John McCain arrives at Grand Canyon University Arena for a night of basketball, and a group of his interns, all GCU students, huddle around him as though they’ve done this before. McCain gathers his thoughts to tell them about his busy day — he has attended several events in the Valley and taken part in a political conference call — but he says he’s well aware they’ve been busy, too. Almost effortlessly, he commends them for their hard work, then talks with each student one by one. 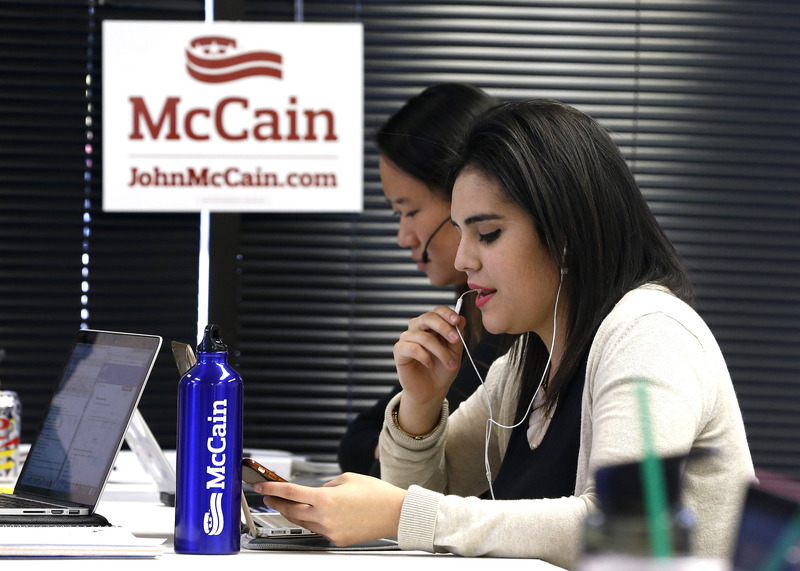 No wonder the 31 students love working for McCain at his spacious campaign headquarters in central Phoenix, a venture they began in October. Sure, they enjoy the new friendships and bonds they’ve made, the free campaign swag, and even the sugar loads. But the best part is getting to know McCain personally. Hilary Gavino and Cathleen Daly work at McCain’s headquarters. Freshman Colson Franse says he finds the senator’s personal stories encouraging. From making calls to answering phones, collecting data, recruiting, managing digital content and implementing projects throughout the week, sophomore Cathleen Daly says there is never a dull day at McCain’s headquarters. “Every day going into the office I know it’s going to be different, and that’s what I like most about it,” she says. But, at the end of the day, the interns share a similar objective: to spread McCain’s message and, above all, gain political support from the millennial generation. On Saturday mornings, the interns huddle at the headquarters — sporting McCain sunglasses and T-shirts and fueled by soda, candy and chips. They pull out their smart phones to check the updated Walk Book application in their devices before splitting up into teams, jumping in their cars and driving off to collect signatures from voters. Franse, who has a passion for business and politics and dreams of running for the U.S. Senate someday, says he quickly learned that the best way to get involved in politics is to get involved in a campaign because of the hands-on experience. 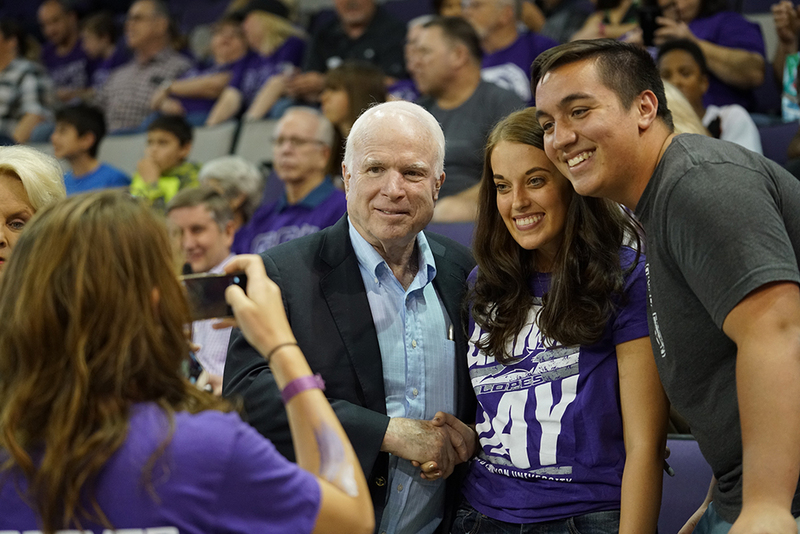 The senator was on hand for the GCU basketball game on Homecoming Weekend and spent time there with his interns. “From grassroots to meeting state representatives to making a lot of connections, there are so many different outlets through which you can gain so much experience in this internship,” he says. Crawford also is no political newcomer. She has been around politics her whole life, including taking part in rallies with her family and volunteering in campaigns. While collecting signatures can be interesting, it is also one of the interns’ most difficult tasks. At the same rate that voters gracefully offer interns bottled water and cheerfully express how much they like McCain, they also shut their doors and taunt them, said sophomore Chelsea Evans. Evans, who is from Washington, says it’s important for an out-of-state student to feel a sense of fellowship. “I came here not knowing anything or anyone, and this campaign team has allowed me to make new friends and meet people who are encouraging and motivated to make a difference in the local community,” she says.